July 31, 2009  Lawmakers are months behind the original goal of making sweeping changes to the nation's financial regulations. Leaders agree that changes are needed, but they just don't see eye to eye on what those changes might be. July 31, 2009  Shaun Donovan calls the 200,000 loans modified through the program since March a "significant achievement," but says the pace will have to pick up to have a real impact. The agency was shooting to have 3 million to 4 million loans modified over three years. July 31, 2009  The House of Representatives took the first step toward an overhaul of financial regulation by passing a bill that aims to curb executive pay deemed excessive. The bill would give shareholders a voice in executive pay and allow federal regulators to restrict pay practices that might encourage risky behavior. July 31, 2009  The recession that began in December 2007 is likely still with us, but it appears to be fading. A report released Friday by the Commerce Department shows the economy contracted at a 1 percent annual rate during April through June. The new data also show the downturn was quite a bit deeper than previously thought. July 31, 2009  The government's cash-for-clunkers program ran out of funds only days after it was launched. Gary Dilts, senior vice president of global automotives at the market research firm J.D. Power, offers his insight. July 31, 2009  The House voted Friday to rush $2 billion more dollars into the government's cash-for-clunkers program. It emerged Thursday that the $1 billion set aside to encourage purchases of fuel-efficient vehicles may be in danger of running out only days after the program began. Economic Recovery Looks Likely, But In What Form? July 31, 2009  Most economists now say the recession is bottoming out and a turnaround is expected in the second half of 2009. But what shape it might take is still a matter of debate. The latest GDP numbers could point to a pronounced "V-shaped" type of rebound, rather than the less desirable and drawn-out "U." July 31, 2009  The government program, which offers owners of old cars and trucks up to $4,500 if they trade in their old vehicle for a new, more fuel-efficient one, has burned through its initial funding. July 31, 2009  Many Americans are still feeling the pain of the recession, and are hard-pressed to see the light at the end of the tunnel. Some people in suburban Chicago comment on the condition of the nation's economy. July 31, 2009  There have been signs lately that the recession is nearing an end. A Commerce Department report out Friday is further proof. It indicates the economy slowed at a pace of just 1 percent in the second quarter of the year. The numbers were better than what had been expected. Canada's Real Estate Market Heating Up, Eh? July 31, 2009  Statistics this week suggest the U.S. housing market may have hit bottom and begun to rebound. But in Canada, real estate is red hot. Bidding wars are driving prices through the roof in Toronto. July 31, 2009  The White House says it's reviewing options for keeping the "cash for clunkers" program going. Auto dealers already may have surpassed the 250,000 vehicle sales funded by the $950 million program. The White House says any valid deals already made will be honored. July 31, 2009  Health care costs are killing small businesses, which pay substantially more in premiums than large firms do. 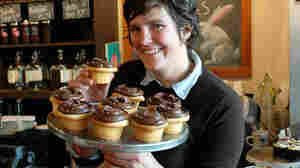 The owner of a cupcake business in Seattle pays as much in health insurance for her employees as she does in rent for four choice Seattle storefronts. July 30, 2009  One of the groups key to passing health care legislation is the pharmaceutical industry, which has been quite active behind the scenes. Billy Tauzin, president and CEO of PhRMA, the biggest trade association for the prescription drug industry, says health care is a moral imperative.